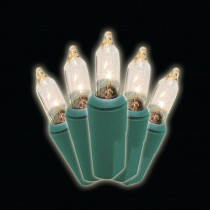 Each strand has 100 clear incandescent mini-bulbs on green wire to blend in with your Christmas tree or landscaping. 37 ft. strand includes 18 in. lead cord, 4.25 in. spacing between bulbs and 3.5 in. end cord. Light set features Socket Lock lamp holders, keeping bulbs secured in place. If one bulb should get loose, the others still remain lit. Each string has end-to-end connector for adding on light sets. Replacement bulbs and fuses included. Suitable for indoor and outdoor use, UL-listed, box of 2.